Nothing can deny the fact that modern muslim fashion has moved a long way. Right from traditional to modern, this journey was a bit tough. The San Francisco fashion exhibition really helped a lot to bring into picture the fact that Muslim clothes are not out of fashion. They are really capturing the eye-sight of millions and millions of women worldwide. In fact, the Muslim fashion took a drastic change with the introduction of modest clothes. It was not before mid-2000s, surely it can be said that really, a new phase started with the modest dresses. According to some sources, the Muslim women prefer today to choose hip-hop modest attires. They are designed by the innovative thoughts of the Islamic fashion designers. The fashion chic is driven not just by innovative thoughts to coup up with the current fashion need, but it is also guided by Islamic religious values. Despite the restrictions, the Islamic ladies are able to create a separate stand in the Global fashion world today. The dressing style of the Muslim community women does not represent anymore a mark of oppression. The modern century is marked by creative modest wears. It is observed that along with Islamic countries, the non-Muslim women are readily embracing the modest costumes. Certainly, it shows that modest wears is now the mainstream. Several fashion shows are held on modest fashion in the US, London, UK, and Paris. In each of the fashion week, a great series of appreciation comes towards the modest dresses muslim. Reina Lewis, the professor of cultural studies wrote a book on Muslim fashion. She said that “Islamic fashion is not just confined to modesty”. The modest dresses clearly highlights about the modern Muslim fashion. The fashion chic that defines that Muslimah fashion style is no more restrictive and conservative. It comes with a perfect mixing of modesty and modernity. The wardrobe of trendy Islamic ladies covers a wide range of fashionable modest costumes. They have a wide array of options to choose modest clothes depending upon season or occasion. Gone, are the days, when they had to cover the entire body with a traditional costume. In reality, the modest fashion has been a great blessing for the Islamic women. The initiators of modern muslim fashion created a great space for the Muslim ladies in the global fashion world. They are able to express their dictatorship regarding fashion and beauty. 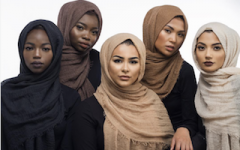 To meet the growing need of fashion style of the trendy women of all faith, the Islamic fashion designers are designing clothes with great thought and notion. Definitely, the muslim women fashion of modern times has shattered the old believe against the Islamic community women. Today, the Muslim fashion chic has been embraced by the beautiful Muslimah women. It is not because, the modest clothes are fashionable, but they give comfort to the wearers. Among the Muslim costumes, the Hijabs are the most popular. Indeed, the Hijab style has changed in the modern era. The present date Hijab gives a mesmerizing appearance to the Islamic women. They have changed in its draping and colour. It is not just a piece of cloth to cover the head but, certainly it has become a fashion statement. The Hijabs are available for every occasion. Usually, the turbans can be worn in different style to match with a particular modest wear. They come in a wide range of colours, designs and printed fabrics. However, women with different facial cuts need not to worry now before purchasing a Hijab. Since, the Hijabs are now available for diverse types of facial cuts. Want to know more about modern muslim fashion and modest clothes, read news and articles published by Goltune News.